Thanks to social media, YouTube, Twitch, and horrifying comments sections, opinions about video gaming are shared quicker than ever. For me – coming from the era where we had to wait a month for the next Nintendo Power to arrive in the mail – I’m often taken aback by the instant reaction. The reason why isn’t the atrocious spelling or the fact that grown men type “u” instead of “you” these days, but because the snap reactions come without apparent context about the past or apparent understanding of the current industry. Others then read that stuff and echo it and it all runs around like an over caffeinated Kremzeek, causing havoc that grizzled old video game vets like me cringe over. But before you look up what Kremzeek is, please take a look below to understand where I’m coming from. Here’s a look at some of the most frequent things I read and why I feel they are beyond wrong. The industry has always had a problem with originality. Yeah, I hear you. We watch the E3 reveals and we look at the shelves at GameStop and we see a ton of games all attached to the same basic gameplay mechanics. Yeah, I’m annoyed by it, too. I always have been. They say hindsight is 20/20, and this is a case where that’s spot on. People wax nostalgic about the good old days where everything was full of originality. The problem is, that era never existed. For every wonderfully original game, we had an endless army of clones that would even make the Call of Duty series blush. Right out of the gate, there were more Pong clones and copies on the streets than legal Atari versions of the game. That got even worse after Space Invaders came out, as hundreds of copies and clones crammed themselves into the arcade market. Even all-time classics such as Galaxian, Galaga, Centipede, and Phoenix at least borrowed from the concept, though you can argue that they did it better. 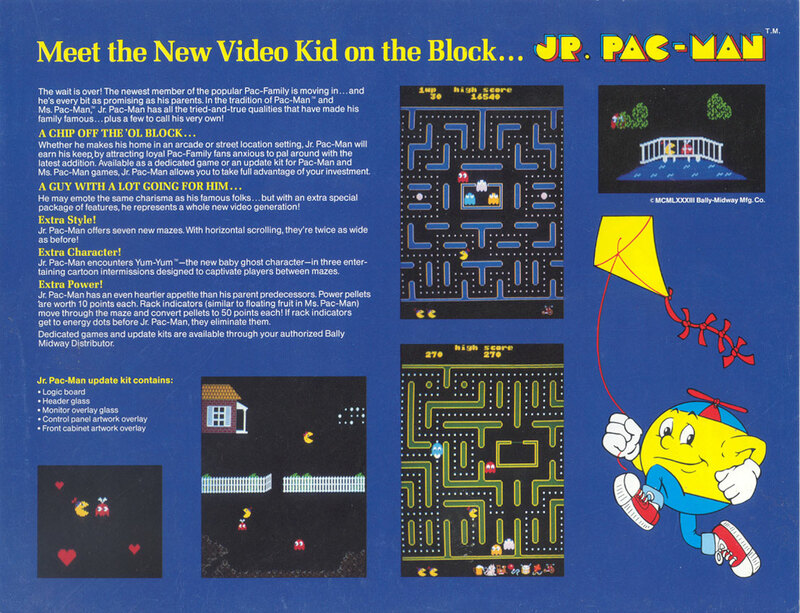 Pac-Man spawned more sequels and spin offs than Michael Bay, with over a half dozen “new” Pac-titles within just a few years of the first game’s release, and that doesn’t even take into consideration the other games that borrowed heavily from the concept or flat out copied it in both arcade form and on home consoles and computers. It continued through the 8-bit and 16-bit console revolutions of the late 1980s and 1990s. We had more side scrolling platformers and beat-em-ups than you could count, more Tetris-like puzzle games pop up than we could play in a million lifetimes, and don’t even get me started on what happened when Street Fighter II hit. I still remember walking through my old Tilt arcade hangout in Mesquite, Texas in the mid 1990s and noting that all but three of the more than 30 games they had in there were fighting game clones and sequels. What happens over time is that we just forget about the clones and sequels and fondly remember just a portion of the really good and original titles. It will happen with the modern era, too, assuming the slow death of physical media doesn’t alter the timeline here. 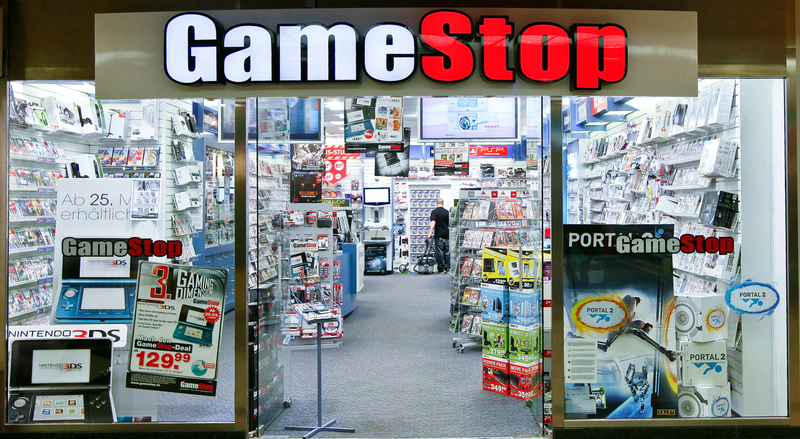 No, you don’t want GameStop to go out of business. Hey, I get it. You’re still sore at the fact that they offered you $2 and a Power-Up card for that year-old game you wanted to trade in toward something new. I understand, as I’m still pissed that I traded in original copies of Earthbound and Chrono Trigger to their former form to buy some PlayStation 1 game that I can’t even remember. But no, we don’t want them to go away. GameStop simply has too many stores, generates too much revenue, and is too much in the public eye for that to be a good thing. I can get why you guys and gals want them to do better, as I do, too. As both a gamer and a video game preservationist, I’ve learned of practices that have tempted me to drive down the highway and knock on their front door more times than I can count. Even as I type that, I can envision myself pulling up there with a megaphone and military helmet in the style of the old D-Generation X invasion of WCW Nitro way back when. But a sudden collapse of the chain isn’t going to make your trade-ins worth more somewhere else, folks. What it would do is kick the hell out of all of those game studios and companies you support, causing massive layoffs and a wide number of shut downs. The reason wouldn’t just be due to the loss of a significant number of sales and market penetration, either. The public and the media would see such a shut down as a ‘video game crash’ that would cause stock values in anything video game related to plummet, which in turn would cause an even greater amount of damage. 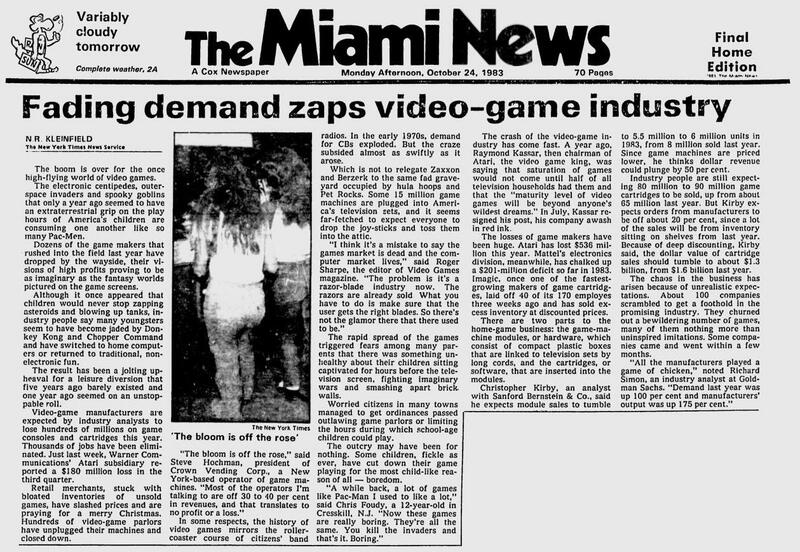 No, “bad games” did not cause the 1983 North American Video Game Crash. The number of people who claim this one makes Baby Jesus cry. Yes, there were a lot of bad games back then. There have always been a lot of bad games in every single era of video game history, so much so that one might argue there have always been more BAD games than good. The same holds true with movies and television and the music industry. There were really two crashes, each of which happened apart from one another. The arcade industry and the home console industries fell at around the same time, causing many to think they did so together. What really caused the console crash was an overstock of games at retailers caused by an arrogant Atari growth estimate. Consumers were still buying product, there was just more ordered than they were buying. The arcade industry suffered from overproduction and way too many arcades and street locations, as well as older inventory that they bought armies of only to watch players lose interest in them within just a few months or years. We’re talking here about vendors who were used to buying a pool table or jukebox and getting a decade of profits who ended up with a small warehouse full of Asteroids and Scramble machines nobody played anymore. Even major hits like Donkey Kong died off within a year, according to earnings reports in old issues of Play Meter. On both sides, the death blow came not from the issues that caused them, but rather the fallout from the perception that the “video game fad” was dead. Yeah, Atari missed projections, but only because those projections were idiotically high in the first place. Stock prices of any company with video game interests plummeted, causing a lot of them to shut down or dump their video game brands to stop the bleeding. Retailers with heavy interests in gaming also took a similar hit, right as they were choking on the inventory they ordered too much of. A lot of them stopped selling video games as result, many of them never to do so again. You used to be able to go into a JCPenney or Dilliards or even the local grocery store to buy an Atari or even a Commodore home computer, folks. This whole thing changed that. Even banks, investors, and creditors got in on the “fad” bandwagon and started to consider video games to be a bad risk. Studios and arcade owners that needed that money for working capital could no longer get it, so they were forced to abandon their ideas and even shut down their businesses. Long story short, it was the perception of industry failure due to some errors in judgement that caused the “Great North American Video Game Crash” over just “bad games,” and going back to the previous portion, that’s what a loss of a company like GameStop would cause to happen again. Perception is often reality, especially in an economy that lives and dies off of quarterly stock earnings more than almost anything else. I might sound like a cynic – or Cranky Kong – in this particular piece, but I really wrote this one out with the hopes that it might get some people to start thinking in big picture terms. If you really love video gaming and this wonderful industry around it, it’s past time to stop reacting so simplistically and with such a lack of insight and understanding about where we came from. 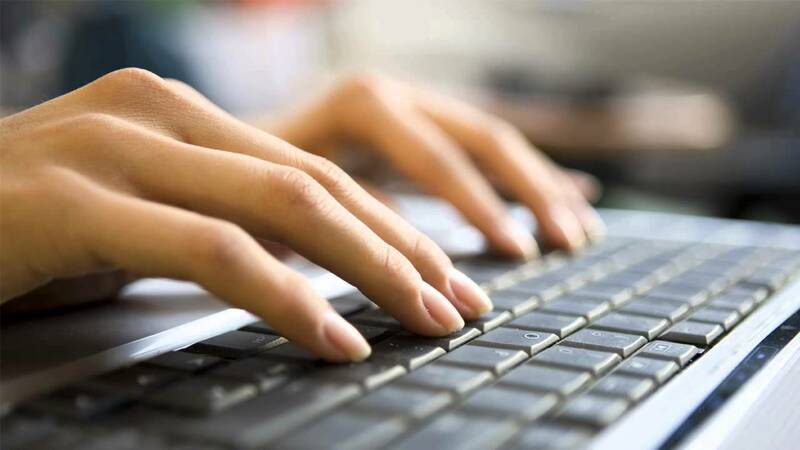 Maybe if that changes someday, comment sections won’t be the seen as the bathroom walls of the modern era, and some real meaningful conversation can instead take place.